Obsidian the developers behind Pillars of Eternity II Deadfire have released the patch notes for update 4.1.0. The patch comes with some new features including the new turn-based mode for beta. 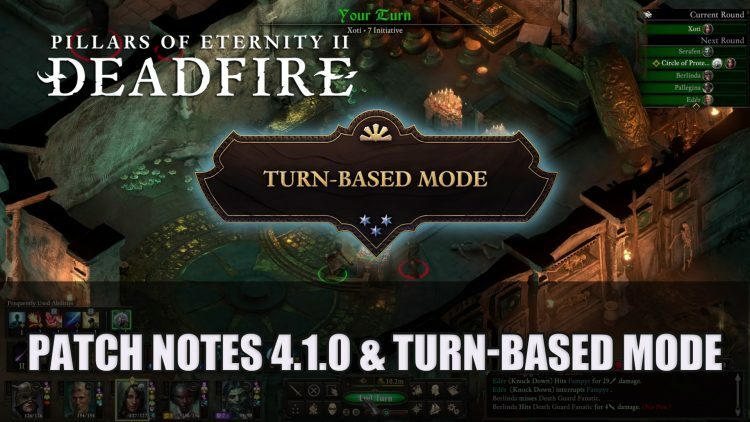 Pillars of Eternity II Deadfire received a new update which brings a new turn-based mode for beta to the game for free as a part of the 4.1 patch. 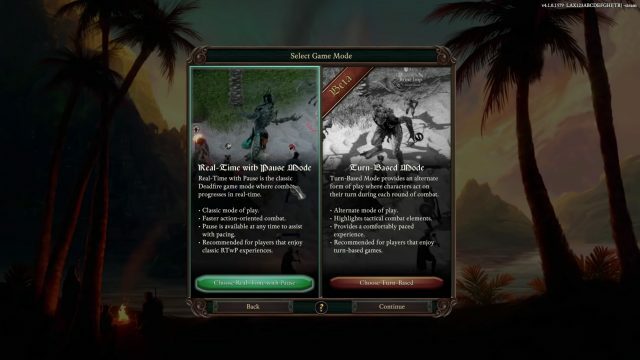 Turn-based mode is another way for players to experience combat in POE II. The mode is still in open-beta meaning players can give feedback to the developers for consideration. In order to try the new mode you will need to start a new game and choose “Turn-Based Mode”. The mode allows players to choose actions for their characters which act independently of each other, you can now plan your attacks and abilities at your own speed. The mode will give a completely different feel to the tactical combat of the game. New turn-based mode is free for all, allowing players more ease with choosing strategies at their own pace. The new patch comes with an array of fixes and updates which were posted on the Obsidian forum including corrupted savegames, optimised performance for targeting attacks which concentrate on large AoEs and party members will no longer die when they go below deck on the ship. Abilities have also gained a few tweaks including monk class ability Effects of Monk’s “Turning Wheel” no longer apply to damage other than melee, Priest‘s Salvation of Time will no longer be empowered due to not benefiting from scaling, and Chanter‘s prepared chants will now be removed when a character is respeccing. You can read the full patch notes below, there are a few spoilers which are highlighted as well. Maerwald will no longer summon a Vela Clone while on Hylea’s Challenge. Starmetal can no longer be obtained if Bekarna’s questline is failed. Fixed issues with Bekarna’s quest logic. The Courier’s Calling encounter no longer triggers without Maia in the party. Choosing to give Wael’s Body to Concelhaut will trigger the correct conversation. The correct end choice will trigger after defeating Oracle and choosing the option to give Wael’s body to Councelhaut. ‘Terrify’ now contains a glossary link where applicable. Attacks with extra AoEs (Citzal’s Spirit Lance, Whispers of the Endless Paths) will now have correct recovery when used with attack abilities. Kalakoth’s Freezing Rake hits only applies to Enemies as described. Concelhaut’s Parasitic Quarterstaff Recovery Time link has been modified and corrected. Brilliant Tactician will no longer activate if there isn’t an enemy present. Arcane Archer “Imbue” attacks will no longer show extra projectiles when used with certain weapons, such as the Hand Mortar. Effects of Monk’s “Turning Wheel” are no longer applied to damage other than melee. Forbidden Fist’s “Forbidden Curse” can no longer become stuck with a negative duration when used with Clarity of Agony. Whispers of the Endless Paths’ AoE Spells are no longer spamming attacks. Maerwald’s Soul Crush ability is no longer missing its string. Soul Mirrors are named properly when only “Forgotten Sanctum” is installed. In the Hall of Reconfiguration, the Frightened Child’s Imaginary Friends no longer bleed when struck with weapons. Servant of the Stars’ death gives the Inspiration to the character as expected. Fixed a bug that was causing Lord Darryn’s Voulge to be not obtainable if not picked up the first time the shipwreck encounter is triggered. Added soulbound sketch to The Weyc’s Wand. 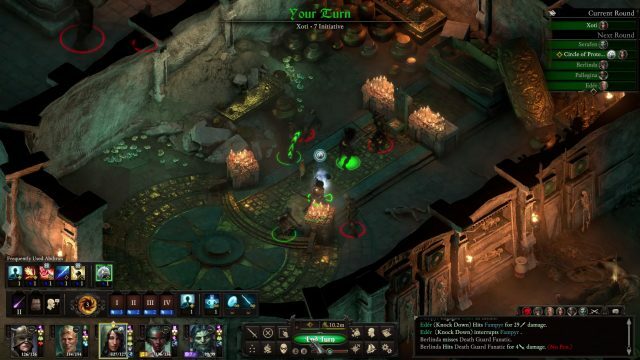 If you are taking on Pillars of Eternity II: Deadfire you should check out some our guides including the latest in Psyblade (Phantom Tactician) and Holy Slayer Build Guide: Righteous Rejuvenator. For all your Deadfire needs drop by our Pillars of Eternity 2 wiki.